Is obtained from the most delicious and ripe olive of the Ayvalık – Gulf region in the North Aegean. It is subjected to centrifugation, resting and filtration processes, and prepared for consumption directly and naturally. Depending on the region of production, its color can vary from yellow to green. Its degree of free acidity, which conforms to international standards, is a maximum of 0.8% of oleic acid type. Kristal Extra Virgin Olive Oil, which adds a smooth and fresh taste to cold dishes, sauces and salads, can be used comfortably in all dishes. 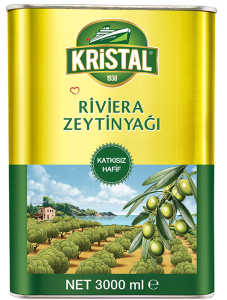 Kristal Olive Oil, which is prepared meticulously from the most delicious and ripe olive in Turkey, is an olive oil with a colour that varies from green to yellow, and which has its own authentic flavour and fragrance. In accordance with international standards, its degree of free acidity is a maximum of 1% of oleic acid type. Kristal Olive Oil, which adds a mild flavor to dishes, can be used comfortably in all hot and cold dishes, and frying.